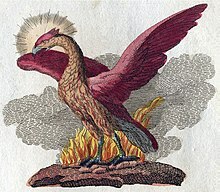 From Old English and Old French fenix, from Medieval Latin phenix, from Latin phoenīx, from Ancient Greek φοῖνιξ (phoînix), from Egyptian bnw (boinu, “grey heron”). The grey heron was venerated at Heliopolis and associated in Egypt with the cyclical renewal of life because the bird rises in flight at dawn and migrates back every year in the flood season to inhabit the Nile waters. Third declension, non-i-stem (genitive plural in -um). This page was last edited on 17 February 2019, at 21:36.